All businesses need to set objectives, objectives are important they focus organisations. An effective way to set objectives is through the popular acronym SMART. Businesses that have SMART objectives are successful because they are clear about what they are trying to achieve and how they will do it. SMART Objectives can be set in all areas of the business e.g. sales, production, finance and marketing. In this article we discuss how to write a SMART objective and provide an example of a SMART objective. 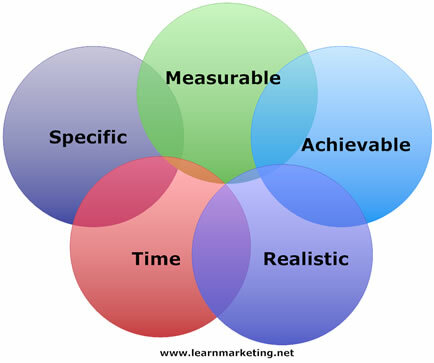 The diagram below illustrates the five components that make up the SMART Objectives acronym, Specific, Measurable, Achievable, Realistic and Time scaled. The 5 elements listed above maximise the chances of you achieving your SMART objective in the way that you would like to achieve it, how you would like to achieve your SMART objective and by the date you would like to achieve your SMART objective. A SMART objectives needs all of the 5 components for success, if you have one missing or incomplete there is a chance you will not fully achieve your SMART objective; in fact the objective is not SMART. Why Are SMART Objectives effective? Specific - An objective that follows SMART is more likely to succeed because it is clear (specific) so you know exactly what needs to be achieved. Measurable - You can tell when it has been achieved (measurable) because you have a way to measure completion. Achievable - A SMART objective is likely to happen because it is an event that is achievable. This is an important check because it asks you to examine your resources and marketing environment (Macro environment, Micro environment and internal environment) to decide whether you are able to achieve the SMART objective. Realistic - Before setting a SMART objective relevant factors such as resources and time were taken into account to ensure that that the objective was realistic. If you are short on time, money, employees achieving a large project within a short period will be unrealistic. Timescaled - Finally the timescale element provides a deadline by which the SMART objective needs to be achieved by. It should help people focus on the tasks required to achieve the objective by breaking large tasks into smaller components that each have their own deadline. The timescaled element provides a useful progress check throughout the project and should dissuade people from postponing task completion unnecessarily. "Increase market share to 3% in 12 months"
Specific The objective specifies what the firm would like to achieve by stating that the firm would like to increase market share. Measureable The objective states that the firm would like to increase its market share by 3%; stating the percentage increase provides something to measure progress against. If after 3 months it looks like the target will not be met, the firm can put strategies into action that may allow it to reach the target of 3% market share. Achievable Before setting the objective the firm examined its marketing environment and the firm's capabilities in order to assess what increase in market share was achievable. Realistic Before setting a 12 month deadline the firm assessed whether it was possible (realistic) to increase their market share to 3% within 12 months based on the resources they had. Time Scaled The timescale for this objective is 12 months. Organisations, businesses and people set objectives everyday, often without realising it. If they test their objectives against the SMART principle, they will increase their chances of success. Once a SMART objective has been set, the next step is to write a plan detailing how the SMART objective will be achieved. Click on the following link to learn how objectives differ from strategy Objectives Strategy and Planning. Or the following link if you would like to know about the structure and content of marketing plans Marketing Plans.